I temper chocolate using a variety of methods, depending on how much I need, what equipment I have available, and the mood I happen to be in on any given day. I started perfecting this method late one spring, when the house was too warm to temper on my marble slab, and I needed some tempered chocolate to make a couple of hundred mocha chocolates for a wedding shower. I soon discovered the advantage over the marble slab technique, no chocolate dripping off the marble onto the floor, no danger of dropping my 3 inch thick slab of marble onto the tile floor (again). 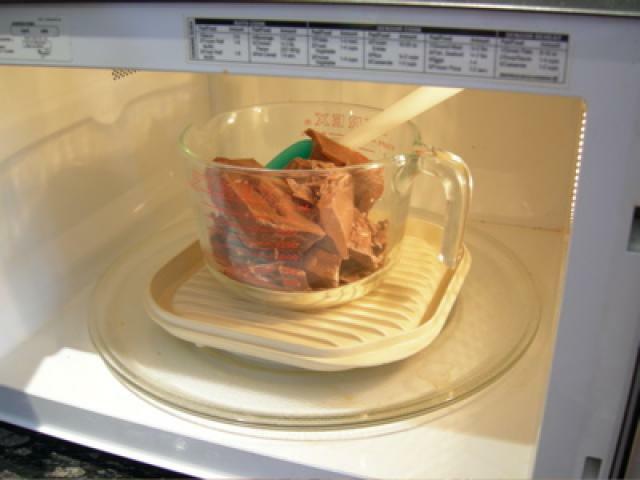 Chop chocolate, place in pyrex measuring cup, place in microwave and microwave on high initally for 1 minute. Stir after heating in microwave. 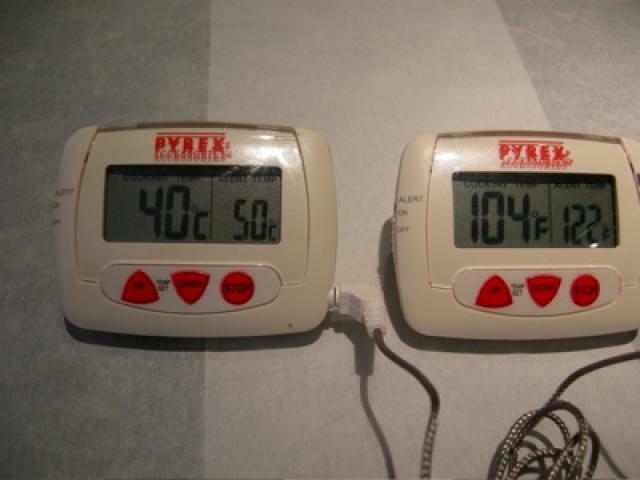 Continue to heat for 20 to 30 seconds at a time, stirring after each heating. After you reach the point where there are just a few small lumps left (3rd picture), heat again for about 10 to 15 seconds more. The temperature will be about 40 degrees centigrade (104 F). I do not let the temperature get above 45 degrees C (113 F). 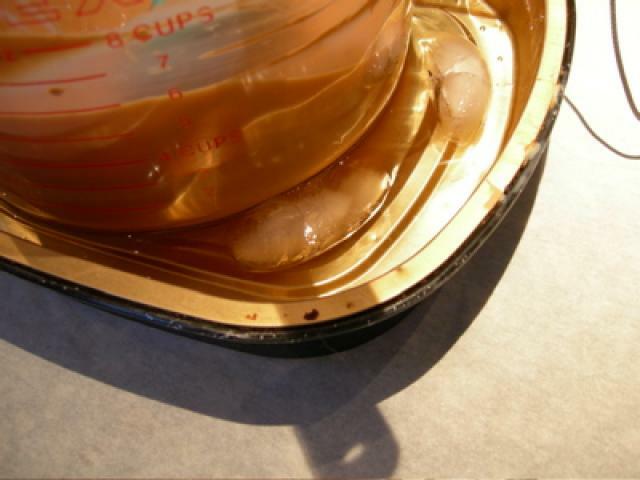 Now place pyrex measuring cup in pan of cool water, taking care not to get any water in your melted chocolate or it will seize. I add a couple of ice cubes to the water to speed cooling. 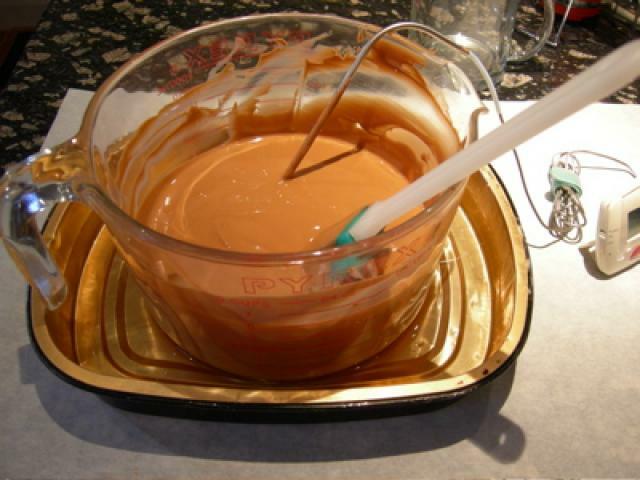 Stir the chocolate away from the sides and bottom of the measuring cup frequently. As the chocolate cools you will begin to notice that it lightens in colour and begins to thicken as you can see in the picture. 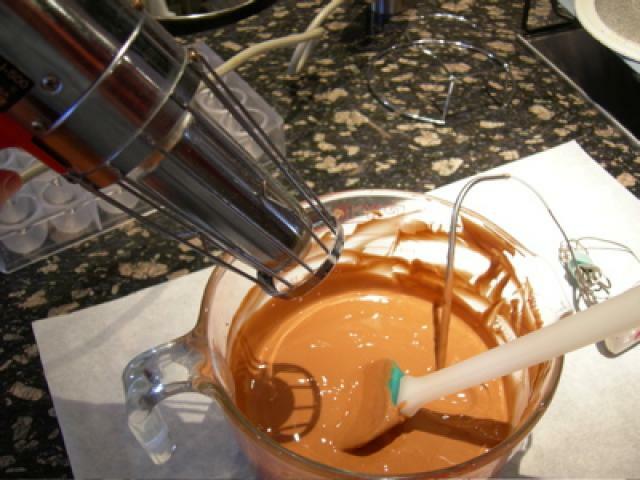 As you drag the spatula through the chocolate you will notice that it forms slight ridges. When the chocolate cools to 25 degrees C (78 degrees F) remove from cold water and wipe the bottom of the measuring cup with a tea towel to make sure water doesn't get in chocolate. 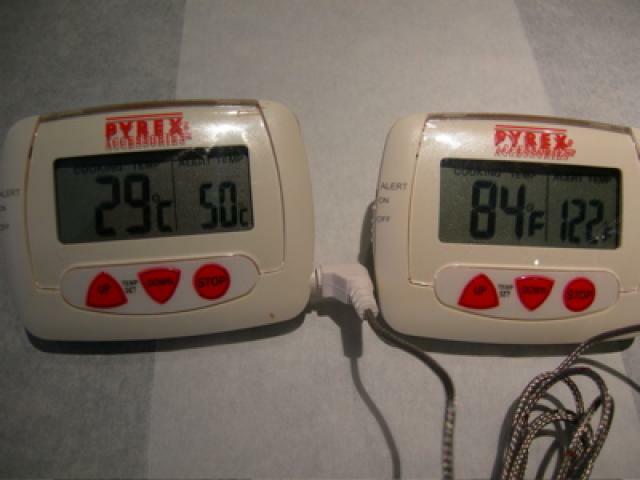 Now I use the heat gun to reheat the chocolate to about 29 degrees C (84 F) which will be my working temperature. 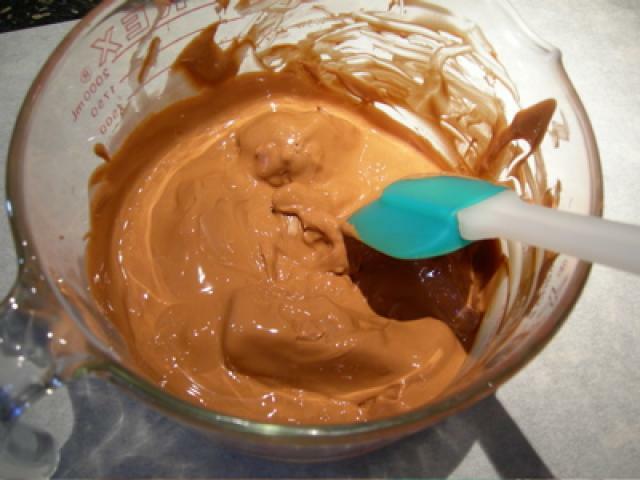 I stir continually while using the heat gun to heat the chocolate that is on the spatula, the outside of the bowl and the surface of the chocolate. Once the temperature starts to rise, I remove the heat, stir thoroughly and wait a minute before adding more heat because often as I stir chocolate off the sides and bottom of the bowl the temperature will jump up. I want to be careful that the temperature doesn't go above 31 degrees C (87) or it may drive the chocolate out of temper. I let the chocolate sit and equilibrate for a few minutes before testing the temper. 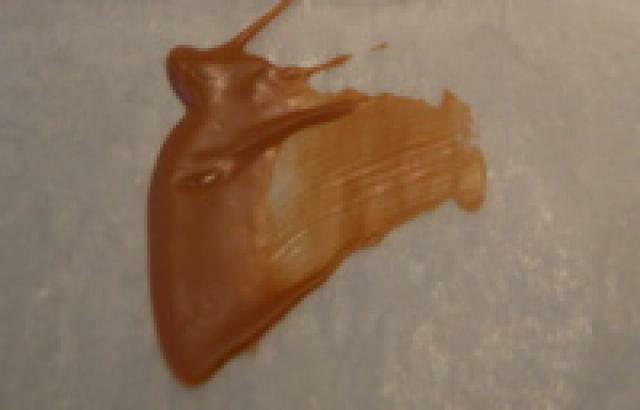 I place a thin streak of chocolate on a piece of parchment and let it sit for a few minutes. It will lose it's wet shine and solidify. It can easily be snapped in pieces. If it doesn't solidify in a few minutes let the bowl sit for 10 minutes or so and test the temper again. If that fails, you can try putting it over the cool water until it reaches 25 degrees again, reheat carefully and retest. This is not a technique recommended by 'proper chocolatiers', the standard teaching is that if you are not in temper, you must reheat back to 40+ degrees and start again, however I have had success doing this in some cases. Once your chocolate is in temper you can start having fun. 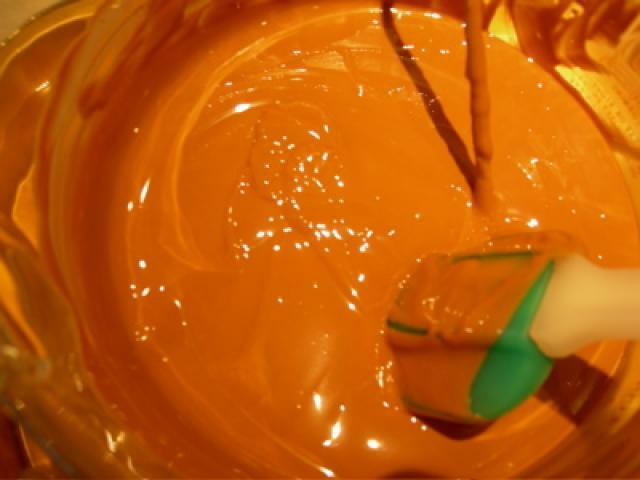 Molding, dipping, making ruffles, truffles or masterpieces. If the chocolate cools a bit, I heat it back up again to the working temperature either with the heat gun or by adding warm untempered chocolate. The tempered chocolate will act as a seed for the untempered chocolate and put it in temper, as long as you don't exceed the working temperature. So try it out, post your sucesses and failures. Ask lots of questions. Thats the first time I've seen mention of cooling off the chocolate by submerging it in ice water. Hum..........I'm not sure what to make of it. It's a new thought!! What about developing the right crystals? I thought the introduction of the in temper chocolate (your seed chocolate) was important............to develop the right crystals. I feel like I need to open Wyabau's book and study up on this whole crystalization process. Thanks for teaching us Kerry! I've added this thread to our index of demonstration threads posted at the top of our Forum. Located here. Is 104 f. sufficient of a temperature to dissolve all the crystals? To temper chocolate, first chop up the chocolate you want to temper. Save a few chunks for later in the process. 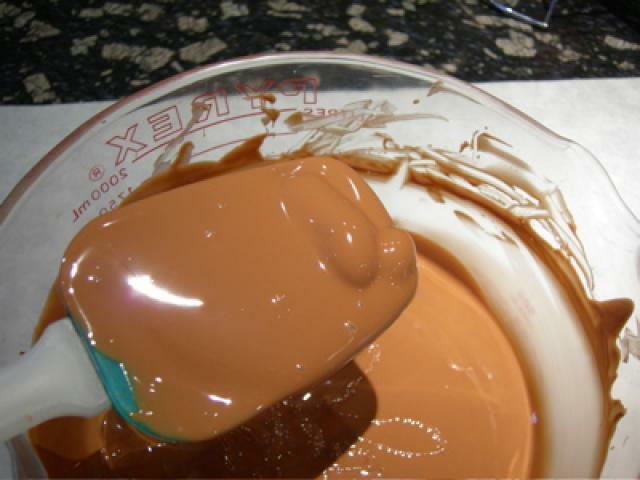 Then, melt all but the few chunks of chocolate over a double boiler to 110 degrees. 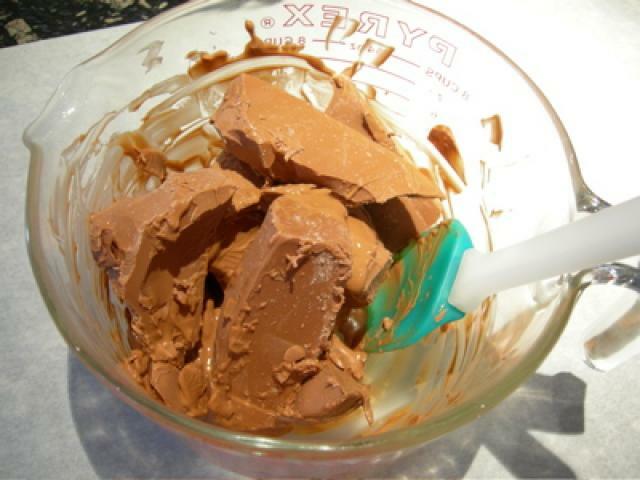 By melting chocolate to 110 degrees F, you dissolve all crystals and start from scratch. Shouldn't tempered chocolate both hard/snappable and shiny? One of our chefs in culinary school at The Culinary Institute of America in New York taught us this method. He referred to it as the cold water bath method. It wasnt the preferred way, but it worked. Although this is a method that you have to be careful with. Sometimes if you get the water too cold the chocolate will cool too fast before you can stir it enough to encourage crystalization. 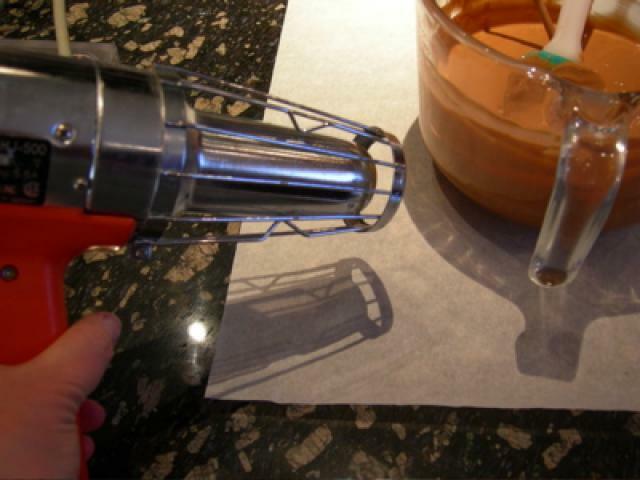 I think this is a great method if you need chcolate tempered fast and you dont have a marble handy. I still think you get the best temper by using a marble and doing the tableing method. But even if you dont have a marble you could still do the seeding method. I would try the cold water method and see if it works for you. Good luck. Ah, Kerry, no mess? Where's the fun? The bigger the mess, the more fun you had right? No, really, thanks for your demo. It took a bunch of time and we appreciate it. tempered chocolate gets its shine from being in contact with something shiny when it sets up...for example a sheet of acetate or a shiny chocolate mold. the side that is not in contact with the mold or the acetate will be matte. thanks for the demo! i usually use just heat up and seed without bothering to cool down and re-warm. i'm leery of using water because i know i'll screw it up (i used to do this method when i first started working with chocolate...i screwed up a lot back then ). what are your thoughts on just the heat up and seed method? where did you get your heat gun? very cool. we appreciate the time you took to prepare the demo and photos.. thanks again! I'm not a pro nor anything similar...but where did you hear that? Okay trying to do the multiquote thing but it isn't going to happen easily apparently. When you use a marble slab you are producing the 'seed' rather than introducing it. The same thing is happening here, the seed is being encouraged by the temperature. As I understand it at a particular temperature a certain crystalline form predominates. So at 25 degrees C, you have predominately stable crystals. Is 104 F sufficient to dissolve all crystals? Good question - we are starting with tempered chocolate in this instance so it seems to be sufficient. If I was starting with chocolate that was left over from another day, streaky and clearly out of temper, I would heat it to a higher temperature and add a proportion of 'fresh' chocolate. Should tempered chocolate be hard/shiny and snappable? 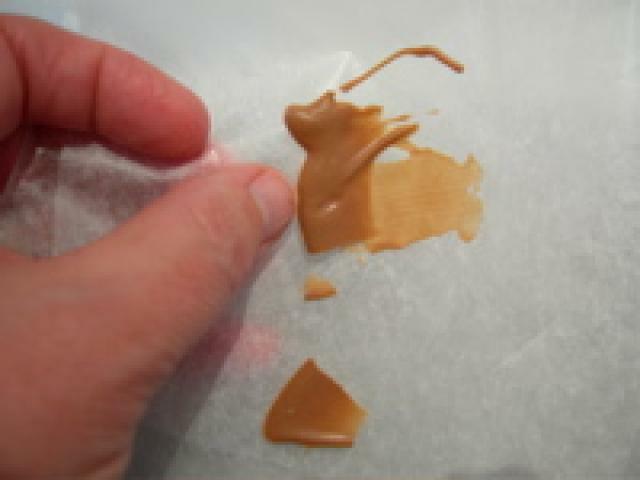 It shouldn't be streaky or have bloom on the surface, however unless it sets up against a smooth surface, such as a mold or acetate it will not be gloriously shiny. My test is usually a a bit more glossy than shown in the picture, my rugrat was feverish and wouldn't be put down all weekend, so this test was done after the bowl had been sitting around for a couple of hours and was reheated a couple of times. You are right about having the water too cold. My inital experiments involved an actual ice bath, chocolate would harden badly around the edges of the bowl and it was difficult to stir fast enough to prevent it. I often do this over just cool water without the ice, or will just leave the chocolate in the bowl on the counter with no water, stirring occasionally until it gets down to temperature, if that fits with my timing. I used to temper much the same way as demonstrated but adding seed before placing over the cool water, but I didn't find it worked any better than no seed. I like a mess when I'm at someone elses house. That's why I teach other people how to temper. It's my husband who has the issue with drips of chocolate down the cabinets, happened one too many times and he objected. He freaked the day the 75 lb marble slab hit the tile floor, you would have thought I did it on purpose - no concern on his part that I might have hit my foot. Good quality tiles though - two with chips out of them, nothing cracked or requiring replacement. I sometimes use the seed and just bring down to the working temperature method, but because the chocolate I prefer is in block form rather than the callets I more often don't. My heat gun is a Hejet, bought off ebay. Compared to my previous hardware store heat gun, this one is fabulous. It has quite the fan, I can blow chocolate off a spatula for about 2 feet. So I still get my share of mess in the kitchen. 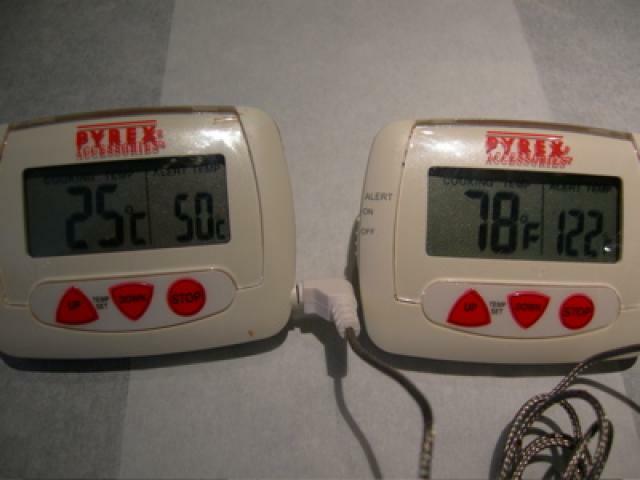 You are so right, tempering is not all about temperature. Temperature is a guide, but you still learn over time to eyeball the chocolate and know when it is starting to become stable. I can tell when my thermometers go out of calibration by noticing that while the thermometer says 27, the chocolate is clearly thickening, so must be closer to 25. When they are starting out with no experience, I find that some people benefit from a cookbook approach initally, then experience will allow them to do away with dependency on the thermometer. Go into a chocolate store and look at the difference between the chocolates that have been molded and the ones that have been dipped or enrobed. The dipped chocolates are clearly more matte. Still smooth, not streaky, no white fuzz on the surface, but not shiney like when they have cooled against a shiney surface. No one here uses Mycryo to temper ?? I am currently using it and its great , it allows me to temper couple of chocolates at the same time ,and the results are always good , only one time I had an overcrystallized chocolate because I have a lousy scale and I add too much of the mycryo .I still make a mess ( and yes the cabinets still get drips of chocolates wich make my little munchkin happy )but thats beacuse Iam like that . I've seen the mycryo at my supplier, but never tried it. They didn't seem to be selling it with the idea of using it to temper, rather as a replacement for gelatin - however that is supposed to work. Mycryo can be used as a gelatin substitute??? AFAIK Mycryo is an emulsifying and stabilizing agent (with a few other pleasant side-effects). It can set product as well? 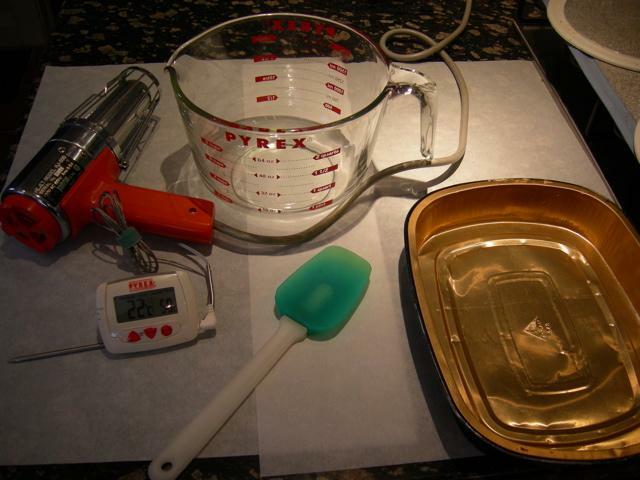 I'm not having any luck adding a link myself, but if you go to www.callebaut.com you can find reference to use in place of gelatin. In the latest flyers they seem to be using it to brown your meat as well. Product looking for it's niche I guess. Place 2 pounds of coarsely chopped, tempered chocolate in a microwave-safe plastic bowl and heat on high power for about 2 minutes. (Some microwaves may require using medium power for white and milk chocolates.) Stir well and continue heating for 30 seconds, then in smaller increments, until it is nearly completely melted. Stir gently to complete the melt. 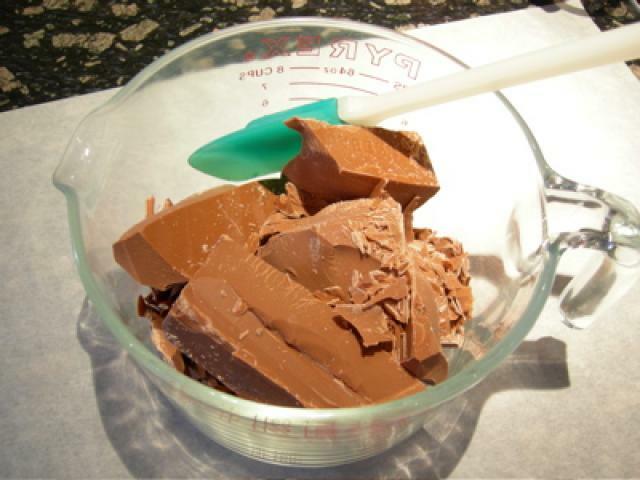 Melt untempered chocolate to 110 to 115 degrees. 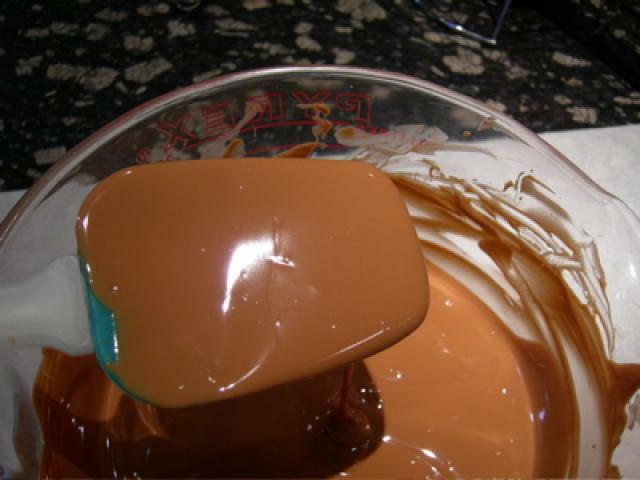 Add 8 ounces of tempered chocolate chunks to the bowl of melted chocolate and stir until a maximum temperature of 90 degrees (dark chocolate) or 88 degrees (milk and white chocolates) is achieved. The chocolate may be cooler but not warmer than those temperatures. Remove all unmelted pieces of chocolate. Set them aside to cool and dry (in the refrigerator, if the room is warm). The chunks are reusable. The chocolate is now in temper and ready to be tested and used. 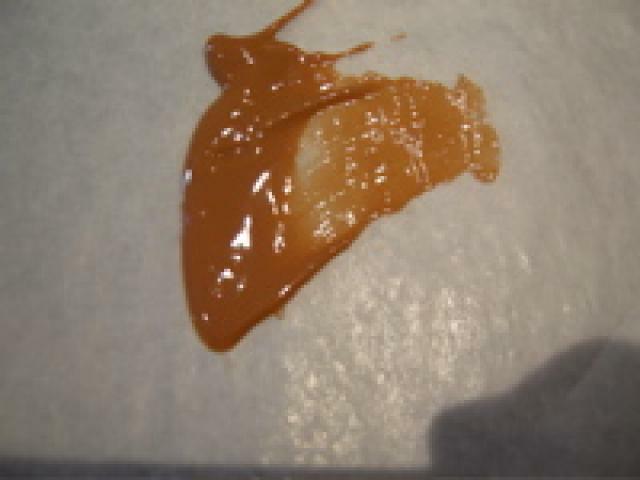 Its only micronizied cocoa butter , and its a stabilazer thats why it works on tempering chocolate , just micro parts of cocoa butter to go and stabilize the chocolate structure. I used it for a mousse and it worked fine. It was your method that got me started tempering in a bowl in the first place. I just went to the water to speed up the cooling. You are so right, there are so many ways to temper. I think the hardest part to get into my head, and the part that makes so much sense now, is that it is just a matter of heating to break the crystalline structure, cooling to the correct temperature to encourage the correct crystal formation, either on it's own by cooling further, or by seed when cooling to the working temperature. When I first read about tempering, the methods were all so different, one sounded too simple, another too complicated, and I wasn't understanding the theory they all had in common. Loving the copies I have of Chocolate Artistry and the Art of Chocolate by the way. Kerry, I'm so pleased that my tempering instructions have been useful to you. It took me a long time to realize that you don't have to be a rocket scientist to temper a bowl of chocolate. People will argue that this method does not produce the best temper, but frankly, very few of them would be able to tell the difference. If nothing else, this method takes most of the fear out of working with chocolate. As I tell my students, chocolate wants to be your friend. As long as you stay within its parameters, it will do almost anything you ask of it.